Trump and Netanyahu: An election-winning friendship? Prime Minister Benjamin Netanyahu is using Donald Trump as a campaign prop, said Michael Wilner in The Jerusalem Post. Facing a tough challenge from the former chief of the Israeli Defense Forces, Gen. Benny Gantz, a centrist, in the upcoming April 9 election, the prime minister has gone all-in on his foreign policy successes, particularly his good relationship with the U.S. president. 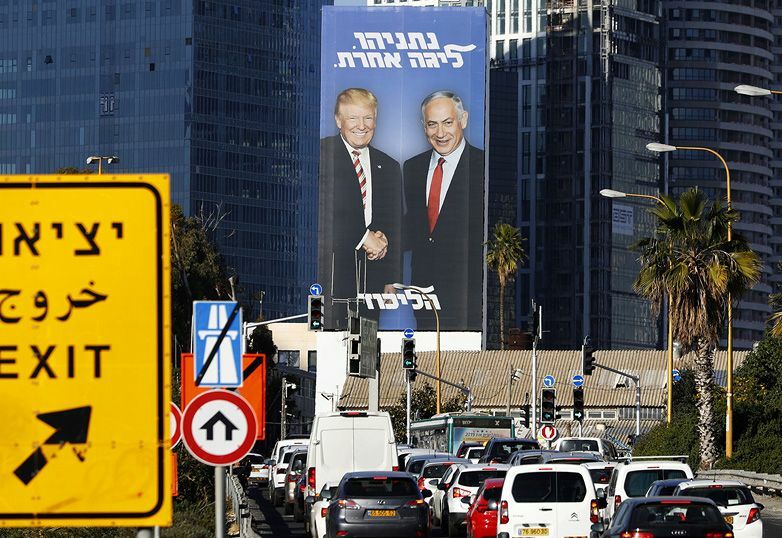 Massive billboards of the two leaders smiling together—the 6-foot-3 Trump artfully photoshopped down to the same height as the 6-foot prime minister—loom over Tel Aviv and Jerusalem. A video released by the campaign shows Netanyahu telling his cabinet that the U.S. Embassy must move from Tel Aviv to Jerusalem, followed by a clip of Trump in May 2018: “Today, we officially open the United States Embassy in Jerusalem. Congratulations.” Trump seems to approve of the campaign. He reposted Netanyahu’s Instagram shot of a billboard on his own feed. When I first saw the billboard, said Nahum Barnea in Yedioth Ahronoth, I felt “offended on Netanyahu’s behalf.” After all, our leader “is better educated, more experienced, and speaks far better English” than Trump. But upon reflection, I realized the two men belong together. Both are dogged by allegations of crime and corruption. Netanyahu, in fact, is facing at least three separate, credible investigations involving fraud, bribery, and breach of trust, and he could well be charged before the election. He denies any wrongdoing. Netanyahu clings to Trump because he has lost the support of the one American who really matters, said Chemi Shalev in Ha’aretz. That would be Sheldon Adelson, the U.S. casino magnate who owns Israel Hayom, an Israeli newspaper that, until recently, was stridently pro-Netanyahu. One of the corruption cases against Netanyahu accuses him of conspiring with a different newspaper publisher to curb Israel Hayom’s circulation—a stunt that surely offended Adelson. Now the magnate is no longer supporting Netanyahu’s Likud party. Instead, he is “rumored to be the driving force” behind the New Right, a party set up by defectors from the far-right Jewish Home party. Adelson apparently “believes that Netanyahu’s end is nigh.” Given that the American billionaire is a “prominent whisperer in the ear of Netanyahu’s BFF, Donald Trump,” Netanyahu may yet see his campaign strategy backfire.